verinice and verinice.PRO version 1.18 are now available for download in the verinice.SHOP or in the customer repository. ATTENTION: Automatic client updates are not possible for verinice 1.18! We have compiled all necessary information about manual updates in a Howto. To update the verinice.PRO server to version 1.18, please use the package manager "yum" as usual (details on the verinice.PRO update). 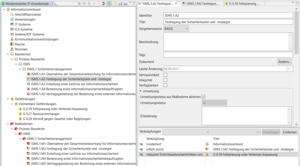 verinice version 1.18 supports the VDA ISA catalog version 4.1.0 for TISAX in German and English language. In the VDA perspective, users can carry out information security assessments including the additional modules prototypes, third party integration and data protection. In addition, the new catalogue contains all information on the maturity model, performance levels, KPIs and other relevant information on the performance of an assessment. Note: The report templates are not yet part of Release 1.18, but will be delivered at short notice. Users of IT Baseline Protection can now convert existing IT networks based on the BSI standards of the 100 series directly into verinice into information networks based on the BSI standards of the 200 series. During the conversion, a copy of the old model is created in the perspective of the Modernized IT Baseline Protection; the old IT network remains unchanged. The conversion can be repeated as often as required. 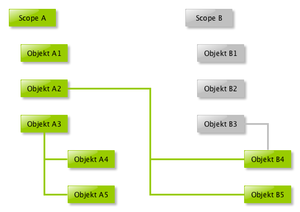 All target objects including all existing links are converted. In addition to this transfer of the structural analysis, the existing protection requirement definitions and inheritances are also automatically transferred. Applications can be converted per tag either as a process (tag: MoGs:ProZess) or application (tag:' MoGs:Anwendung) (case sensitive). Where necessary, groups are created in the new model, see e.g. 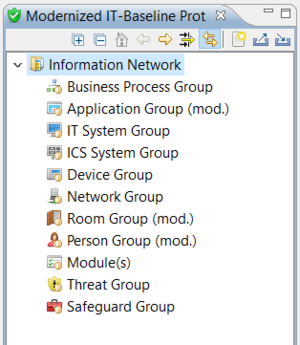 the subgroups Buildings and Rooms in the new information system. In rare cases the type of a link cannot be converted uniquely, the link is then marked with PRÜFEN:Verknüpfungstyp in the description and can easily be corrected. Object types that were not used in the old IT Baseline Protection are not copied. These can be newly created via the context menu with a right mouse click. A migration of modules from the old IT Baseline Protection Catalog to the new IT Baseline Protection Compendium does NOT take place. Invalid values and double designations in the risk configuration are intercepted. Inconsistencies after changing risk configuration values and during calculation are avoided. The derivation of the safeguard strength was corrected for the case that probability of occurrence or effect was set to unedited. Inconsistencies when changing risk values using the bulk editor have been corrected. Display and change of risk values in the web frontend have been improved. The settings for derivation are no longer overwritten when a previously modeled module is repeatedly modeled. Incorrect modeling of entire module groups is prevented. The missing display of the view Links during reload has been fixed. Fixed a bug where requirements could not be opened in the editor if the option BSI-200-3 was not enabled in the settings. Added deletion of people with accounts in the Modernized IT Baseline Protection perspective (verinice.PRO only). Tags can now also be selected in Modernized IT Baseline Protection using the key combination Arrow down. Missing or wrong icons have been corrected. 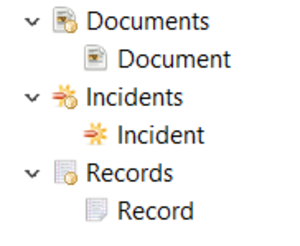 Added property tags for object groups documents, incidents, records in Modernized IT Basic Protection for unification. 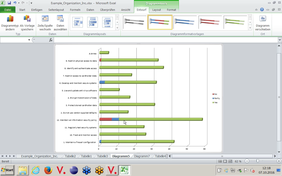 Performance has been improved when generating reports A.4 and A.7. 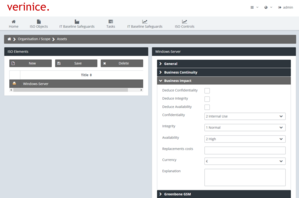 In the risk analysis wizard, you can now edit and delete your own threats directly. The option Shown in SoA-Report is now always visible by default. Fixed bug when editing people with mass editor. 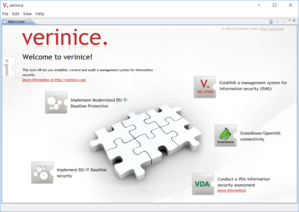 verinice is delivered from version 1.18 with a Java Runtime Environment (JRE) of the initiative AdoptOpenJDK. AdoptOpenJDK creates JRE which contain all security patches and may be used free of charge. For verinice users nothing changes: verinice will still contain a current JRE and the installation will be as easy as possible. Previously (incl. version 1.17) verinice contained a JRE, which was published by Oracle free of charge. However, Oracle changed the Java release cycle and the license for the JRE in 2018, so that it will no longer be possible to deliver verinice with the Oracle JRE from 2019. Since version 1.18 there is no client for 32-bit Linux systems anymore. verinice is delivered with the Java Runtime Environment (JRE) of the AdoptOpenJDK initiative. AdoptOpenJDK does not provide a JRE for 32-bit Linux. For this reason, verinice cannot be created for this architecture. As before there will be a Linux version of verinice for 64-bit systems. Source ID and External ID can now be exported in report queries. This makes it possible to export data in order, for example, to have it processed externally in Excel and then to import changes again via CSV import. With CSV import, the fields are provided with domain/perspective and ID, so that mapping between data to be imported and data fields in verinice is significantly simplified. 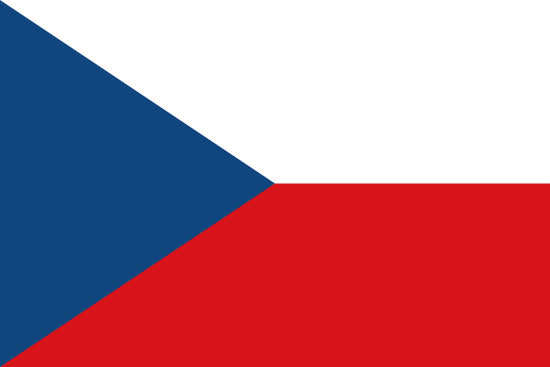 As of version 1.18 verinice is available in Czech language. For details see the corresponding product information in czech verinice hovoří česky. Version 1.18 of verinice.EVAL brings back the import function for .vna files, so that users can import demo data. The bug when opening the object browser if opened before the editor is fixed. Fixed an error when saving empty files (0 bytes) in the File View. The option Change password was deactivated by default in the single-user version. Problems when updating report templates in the View Template Repository have been fixed (verinice.PRO). To avoid accidental changing of field contents while scrolling in the editor, the mouse wheel function for the controls Single-Select and Date Fields has been deactivated. When assigning an already created task to another person, the domain/perspective does not have to be selected again. Invalid combinations of due date and reminder period intercepted. The verinice.TEAM is currently revising all report templates fundamentally and will publish them in a forthcoming follow-up release verinice 1.18.1. All report templates will be available for download in the verinice forum as pre-releases! verinice and verinice.PRO version 1.17.2 are available in the verinice.SHOP and the update repository. ATTENTION: Automatic updates of the clients are not possible for verinice 1.17! We have compiled all necessary information for manual updates in a HowTo. To update the verinice.PRO server to version 1.17, please use the package manager "yum" as usual. In some cases, elementary threats were linked to incorrect target objects during modeling. In borderline cases, some modules could not be modelled at all, in particular the modules DER.4, ORP.4, OPS.3.1 and OPS.2.1, if the modelling was carried out with blank measures. Requirements could not be opened in the editor in case the BSI 200-3 section was activated in the settings. Performance was optimized in all perspectives, especially for large information networks, by making the creation, display and deletion of links more stable and performant. In addition to direct influences, boundary effects such as the creation of the search index and the deletion of objects in general have also been optimized. The update to verinice 1.17.2 is recommended for all users of Modernized IT Baseline Protection. verinice and verinice.PRO version 1.17 are available in the verinice.SHOP and the update repository. ATTENTION: Automatic updates of the clients are not possible for verinice 1.17! We have compiled all necessary information for manual updates in a HowTo. To update the verinice.PRO server to version 1.17, please use the package manager "yum" as usual (see details on the verinice.PRO update). As an administrator for a verinice.PRO server please notice the security notes at the end of theses release notes! In addition, verinice 1.17 now always models all module requirements (basic, standard, increased protection requirement) and, if activated, all associated implementation hints. 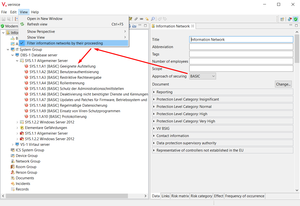 If the related filter is activated, the requirements or safeguards are filtered according to the procedure for protection defined for the information network. The filter also acts on linked threats, e.g. only threats that are linked to basic requirements are displayed in the link maker. This ensures that, for example, after a successful basic protection of an information network, it is easy to switch to the standard protection. When verinice 1.17 is started for the first time, all previous modeling in the Modernized IT Baseline Protection is migrated to the new modeling. The IT Baseline Protection Compendium is planned to be released in English by the BSI at the end of 2018 and will be available for use in verinice afterwards. Parallel to the IT-Baseline Protection Compendium, the verinice.TEAM provides a catalogue which contains all modules from the 15th Supplementary Delivery of the IT-Baseline Protection Catalogue that are not yet available in the new IT Baseline Protection Compendium. The modules of the 15th Supplementary Delivery can thus be modeled directly in the New IT-Baseline Protection by Drag&Drop, requirements are generated from the safeguards of the 15th Supplementary Delivery and can be adapted if necessary, safeguards are available as implementation hints and the threats of the IT Baseline Protection Catalogue are modeled as additional threats. 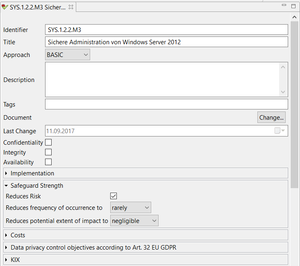 The filter in the Modernized IT Baseline Protection View now allows you to search for implementation status and security level for requirements and safeguards. In addition, some missing relations have been added and incorrect relations haven been corrected, so that the data can now be used in queries and reports (e.g. relations between requirements and network components in the Modernized IT Baseline Protection). The verinice.TEAM has updated the development environment to a newer version to fix some operating system related problems (macOS X, Ubuntu Linux) and to ensure future security. In the editor area several views can now be opened one above the other, which can be helpful for some tasks in verinice. ATTENTION: Due to the new framework an AUTOMATIC update from an older version to verinice 1.17 is impossible! Please notice the description of updating manually to verinice 1.17: Update to verinice 1.17. 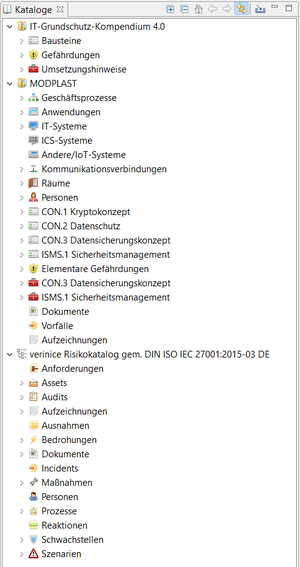 The new catalog view is now used by default in the Modernized IT Baseline Protection and ISM/ISO perspectives. In the ISM/ISO perspective, the new catalog also replaces the old CSV catalog, which will be discontinued in the next verinice version. In addition to the drag & drop modelling of the IT Baseline Protection Compendium components already introduced in verinice 1.16, all elements can now also be copied from the catalog view to the model view (tree) using the context menu (right mouse click) with or without links. When copying with links, unlike in the Model View, no links are copied back into the catalog, but only links between the copied objects themselves! Requirements or safeguards can be used to define whether they reduce a risk and what effect they have. The safeguard strength reduces either the frequency of occurrence or the impact to a lower value, the risk itself is calculated on the base of the defined risk matrix and cannot be changed directly. If several requirements/safeguards are linked that result in a risk reduction, the risk is set to the lowest value with regard to frequency of occurrence or impact (minimum principle). verinice 1.17 now also supports the connection to an Active Directory for the Modernized IT Baseline Protection and enables the task workflow for the creation of tasks, e.g. for the implementation of requirements or safeguards. Bug fixes and minor improvements in the bulk editor. In the web frontend, the behavior of different elements has been improved, in case the approval process is activated in the task workflow. The email link for notifications in the task workflow has been corrected. The default memory for verinice was adapted to current systems and increased to 4 GB for the client and 16 GB for the server. Please note that verinice 1.17 migrates all information networks created in the Modernized IT Baseline Protection at the first start due to the changes of the modeling. Please create a backup of all data before the first start! verinice and verinice.PRO version 1.16 are available in the verinice.SHOP and the update repository. Attention: As an administrator for a new verinice.PRO server please notice the security notes at the end of theses release notes! 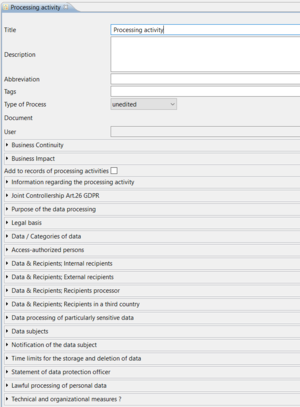 verinice 1.16 supports the documentation required by the GDPR, including the processing activities, technical and organisational measures and contracted data processing. The implementation status has been improved. Now it works in the same way as in the old ITBP perspective. The status is indicated by icons (yes, no, partially, na, unedited). In addition to the display in the tree structure of the View Modernized IT-Grundschutz, the status is also displayed in the links (link makers) and in the tab area of the object editor. The "Identifier" field indicates requirements, measures and hazards for links in the link maker. This makes it easier to identify which target object or objects mentioned above are linked to each other. The IT Baseline Protection (ITBP) Compendium has been optimized for verinice and minor changes by the BSI have been added. A new version of the ITBP Compendium is available for download in the update repository or on the verinice website. In oder to support the various tasks of documentation three new object types (documents, records, incidents) have been added to the perspective IT Baseline Protection. The creation of report queries has been improved in verinice 1.16 by adding context to all elements. For each element the perspective it is used in is displayed now (ISM, ITBP old, ITBP new, ...). Additionally the objects ID is displayed as defined in the SNCA.xml and therefore enables better differentiation of i.e. object groups and pbjects itself. verinice.PRO can be installed on servers with Red Hat Enterprise Linux (RHEL) 7 and CentOS 7 now. RPM packages for RHEL 6 and CentOS 6 as well as for the new version 7 are available in two repositories. The verinice.TEAM recommends to install RHEL 7 or CentOS 7 on any new verinice.PRO server. Red Hat supports RHEL 6 until 2020. We have not yet decided how long packages for RHEL 6 and CentOS 6 will be provided. The end of support for theses versions will be announced in advance. verinice and verinice.PRO version 1.15 are available in the verinice.SHOP and the update repository. Attention: Administrators for verinice.PRO servers please notice the security notes at the end of theses release notes! verinice 1.15 is the first iteration of the New IT Baseline Protection according to the BSI Stadards 200-1, 200-2 and 200-3. To implement the new standards the data model has been extended extensively and future-proofed, all new object types required by the New IT Baseline Protection are available. The graphical user interface has been extended with the new perspective New IT Baseline Protection and the new views IT Baseline Protection Model and IT Baseline Protection Compendium. 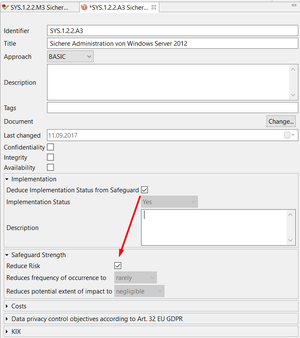 The IT Baseline Protection Compendium is available as verinice XML-Datei (.vna) for import in the new view IT Baseline Protection Compendium. 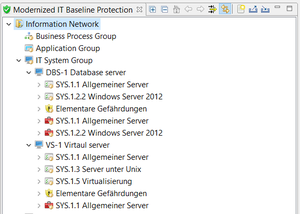 Remark: So far the IT Baseline Protection Compendium is only available in German! Information networks can be modelled following the basic, standard or core protection. The reference documents A.1 to A.4 are available as report templates. The verinice.TEAM will continue to implement the New IT Baseline Protection and release additional verinice versions in 2018 adding further concretisations provided by the BSI. This includes the risik management and especially the migration from the old New IT Baseline Protection Catalog to the New IT Baseline Protection Compendium. verinice 1.15 lays the foundations for the EU GDPR and the use of the enhanced data privacy module, which will soon be available for download in the verinice.SHOP or in the update repository. The verinice module will support the mapping of the the dircetory of processings and the contract data processing. Until May, extensions are planned for the privacy module so that risk management for data privacy and the data privacy impact assessment can be done with verinice. The verinice.TEAM has addressed various further issues in verinice 1.15, including bugfixes and smaller changes based on customer requests that improve the overall performance and usabillity. In addition certain improvements according the overall security have been implemented. The search functionality has been improved by fixing various bugs. Serach and indexing are more stable now in borderline cases. The use of report queries generated in verinice has been improved when working with the v.Designer. 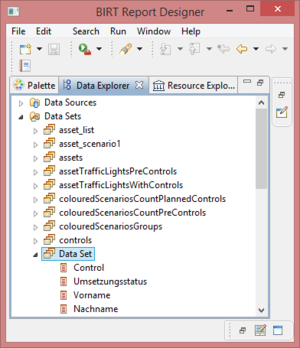 vlt-Files can be loaded in the v.Designer and may be used as data sets directly. Multiselect-fields are now displayed correctly. Depending fields are displayed correctly now. By improving the verinice.REST-interface the connection of external systems has been made easier (KIX). With verinice 1.15 the verinice server requires Java 1.8. As of today verinice 1.14 is available for download in the verinice.SHOP and in the verinice.PRO download repository. CAUTION: As an administrator of a verinice.PRO server please regard the security notice at the end of these release notes! verinice.PRO users will find the webfrontend in verinice 1.14 in a new look and feel. The appearance has been reworked completely, usage is way more convenient thanks to the contrasty and sleek user interface. Even more the webfrontend got various internal improvements related to security, i.e. complete support of access rights. Access can be provided by deep links to any verinice user and an explicit logout function has been implemented. The new responsive template enables comfortable use of the webfrontend on mobile devices. The new webfrontend is an investment into the future and fundament for a variety of new features. The first and most palpable feature implemented in the new webfrontend is the grahical presentation of the implementation status for ISO-Controls and IT-Baseline Protection Safeguards regarding one or all organisations/scopes. Users can provide their management with the current status of the ISMS anytime and in real-time. 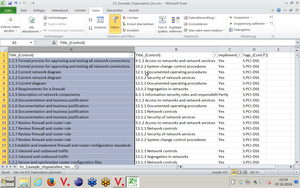 Especially in larger installations with various organisations/scopes the implementation status are displayed in identical scales to allow direct comparison. The gaphical presentation in the webfrontend gives way to a new and important aspect: visualization of information security and presentation of specific issues in real-time. 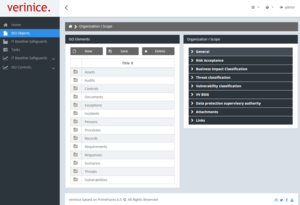 In addition to the new reporting technology that has been introduced with verinice 1.13 and receives further improvements with version 1.14 verinice continues to ease the daily work challenges of CISOs and provides an easy way to report results and success of their work. 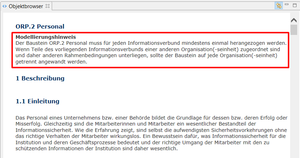 In oder to have access to all details and descriptions in information security standard e.g. 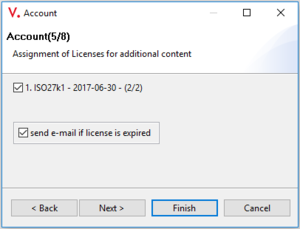 ISO, verinice 1.14 now provides the complete standard including any content that is subject to license. Get rid of studying large documents in paper form and error-prone manual data entry - the original content can be provide to each user as needed. The new license management in verinice 1.14 guarantees organisation-wide compliance with license regulations in information security. Licensing is possible per user per year and therefore enables efficient allocation of ressources and expenses. Licenses for available content can be puchased briefly in the verinice.SHOP. CAUTION: Due to licensing restrictions any licenses in verinice covers usage and display in verinice only! The original documents are not distributed in paper form or any other digital form outside of verinice. When running a risk analysis in the ISMS perspective users can now select for which organisation/scope the calculation shall be performed. This reduces the time for analysis significantly which is especially helpful in installations with many organisations. 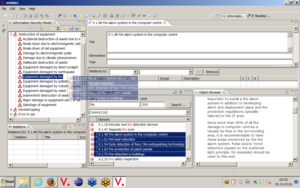 A dialog now confirms when the risk analysis has been finished successfully. With the query builder introduced in verinice 1.13 user specific report templates can be generated fast and easily. In verinice 1.14 older and not longer used report templates have been discontinued to aid clarity in the report repository. 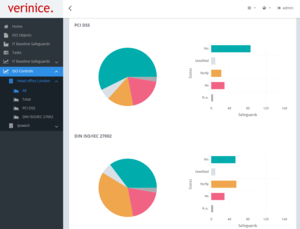 The verinice.TEAM will continue to switch other older report templates to the new report technology in order to increase the performance when creating reports. The query assistant has been further improved, queries can now run over data for all organisations and scopes in verinice 1.14. The connectivity between verinice and v.Designer has been optimized to improve the creation of user specific report templates based on data sets in verinice.PRO as well as in the standalone version. The interface to the database has been extended in order to simplify usage of user specific datafields. The v.Designer is available for all verinice.PRO users in the download repository. User of the standalone version can purchase the v.Designer in the verinice.SHOP. Due to the upcoming GDPR the old data privacy view will be discontinued with verinice 1.15 and should not be used anymore. For new data privacy projects the verinice.TEAM offers a special module/catalogue. This module is at present only availaible in german language and according to german legislation (interpretation of GDPR). Users from any other countries may contact the verinice.TEAM to adapt the module to their countries regulations. The verinice.TEAM has addressed various issues in verinice. 1.14, including bugfixes and smaller changes based on customer requests that improve the overall performance and usabillity. In addition certain improvements according to the overall security have been implemented. File veriniceserver-security-web.xml has been deleted. As of now version 1.13.1 of verinice and verinice.PRO are now available for download. CAUTION: As a verinice.PRO server administrator please regard the change log at the end of these release notes. The Business-Impact-Analysis according to the Baseline-Security-Standard 100-4 is now an integral part of verinice. This BIA provides all required information regarding critical business processes and resources. It complements the BSI-Risk-Analysis according to BSI-Standard 100-3, that provides all required information regarding existing risks against which your organisation should be safeguarded. The Query-Builder got a new and way more intuitive graphical user interface. Select any row and move or delete it directly. In the query results cells with repeating content, i.e. parent elements, will be filled now. This enables better sorting and filtering in spreadsheet tools. To enable you to link various objects in different tables in the report designer (datacubes) the query builder now supports the export of database-ID's (such as Scope-, Parent-, UUID's). Additionally the verinice.TEAM has implemented various improvements that simplify the use of the query builder in general. 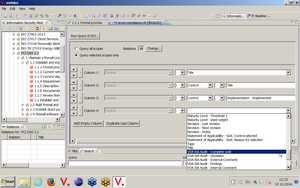 With verinice 1.13.1 the Query-Builder including its graphical user interface is available in the verinice report designer. This enables you to create your own datasets intuitive using the Query-Builder and to present data in a variety of charts, spreadsheets and other elements. Provide your resulting report templates to all users or specific user groups and enable them to create standardised one click reports in your organisations layout and style. Link table reports can now be created, stored and loaded in both verinice and the report designer. One base for a broad range of use! The verinice.TEAM will convert selected report templates to the new technology on base of the Query-Builder shortly and speed up the creation of these reports significantly. On top of this the v.Designer including the new Query-Builder GUI is now available as a standalone add-on for the verinice-client and can be purchased in the verinice shop. This gives all users of the standalone version the option to easily create their own reports based on their own data including any customizing. 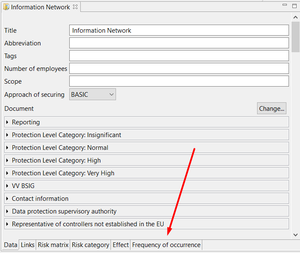 In links between assets and scenarios in the ISMS perspective verinice 1.13.1 now shows the calculated net risk values (risks '''with''' implemented controls) in addition to the gross risk values (risks '''without''' implemented controls). This presentation enables a better comparison and evaluation of specific risks according to ISO 27005 while working with assets and scenarios in verinice. 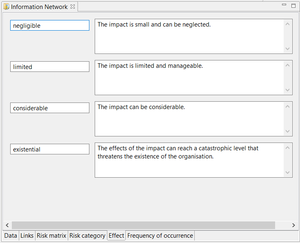 The net risk values are available for output via Query-Builder of course. The risk treatment method can be selected and documented likewise for each combination of asset and scenario in the link maker. You can choose accept, transfer, avoid, and modify as risk treatment method according to ISO 27005. 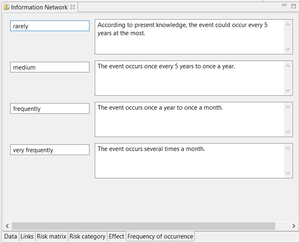 Again the risk treatment method is available for output via Query-Builder. The task workflow has been extended by a release process that can be activated optionally. Any changes in objects related with a certain task will only be saved when the originator of that task approves the change. Changes may be rejected and can be reassigned to the same or any other person. To support your decision about an approval all changes can be compared with the original values in a dialogue. The verinice.TEAM has addressed various further issues in verinice. 1.13.1, including bug-fixes and smaller changes based on customer requests that improve the overall performance and usability. In previous versions of verinice the default profile for "scope-only" administrators included the permission to change access rights and user profiles. Since this allows a scope-only administrator to escalate his priviliges by changing his/her own profile, we have removed this right and some others from the default profile. If you have used this profile without changing it, these changes will become active automatically. If however you have made changes or created your own profiles based on this preset, you will have to remove the questionable actions from these profiles yourself. New: veriniceserver.gsmGenerator.cron=0 5 3 * * ? We are proud to present version 1.13 of verinice and verinice.PRO which are now available for download. Starting with this version, the verinice client has to be purchased at the verinice.SHOP. CAUTION: As an verinice.PRO server administrator please regard the security notice at the end of these release notes. Our new query assistant enables you to query your data directly from the verinice client. Let's say you need a list of interrelated security controls from different standards. No problem. Or maybe you need a list of assets with risk scenarios and responsible personnel? Also created with just a few mouse clicks. For every object you can determine exactly which fields to extract. All queries can be saved as CSV files and opened in Microsoft Excel or LibreOffice Calc for further editing. Using the familiar functions of your spreadsheet application you can sort, filter or create charts based on the data. The best part: even queries over thousands of objects and complex structures run lightning fast and are usually completed in a manner of seconds. This is achieved by using an in-memory query mechanism created especially for this purpose: every query created by the user is translated into our own "verinice Query Language" (VQL). This query is translated into a graph model that loads just those elements of the database that are required to answer the query. The actual query is then run in memory and the result table saved to disk. We introduced additional security measures in different places. Encrypted database exports in the VNA format now each have an individual salt value to thwart dictionary attacks. In previous versions the same salt was used for all files. Due to this change, encrypted exports made with verinice 1.13 cannot be imported in older versions of verinice. Report creation has been moved into a sandbox that limits the possible actions of report templates. This mechanism can be turned off if you have individually created templates that would conflict with the new stricter guidelines. Since report templates can contain potentially malicious code segments (much like macros in MS Word documents) you should not turn off this additional security mechanism, especially if you want to use report templates from third parties. verinice.PRO received an additional security layer that compares the use of services with the user profile and prevents forbidden actions. Objects in search results can now be used for drag and drop operations. You can select multiple objects at the same time. For instance, you could search for risk scenarios regarding "compliance", chose the ones you want and link them to a relevant asset immediately. 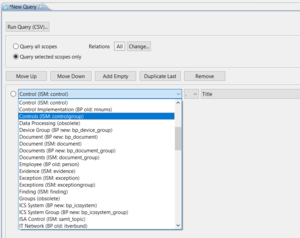 When copying objects in the tree view by copy and paste you can now choose to make copies of all attached files as well. This behaviour can be toggled in the preferences. A new REST API allows network based access to the verinice database for third party applications. This enables a lot of opportunities to integrate verinice.PRO with other software tools. Of course all access over this new interface is subject to all existing security restrictions. We have teamed up with c.a.p.e. IT to bring ISMS and ITSM together. Newly created database properties allow objects to link to OTRS tickets. The KIX workflow state can be transfered to verinice and changes to verinice objects can be made directly in the OTRS ticket. Changes will be written to the verinice database when a ticket is completed. 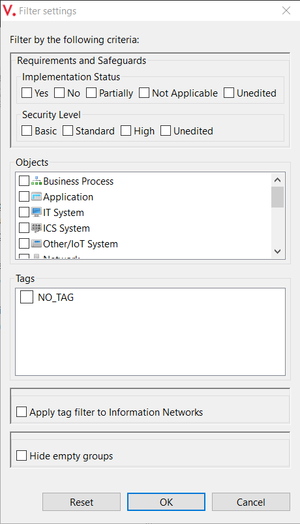 You can also import configuration items from your ITSM into verinice as additional assets. To talk about your individual demands both SerNet and C.A.P.E. IT are standing by to offer their assistance. It is now easier to connect to a Greenbone / OpenVAS vulnerability scanner. You can use the special verinice vulnerability management workflow to aggregate and assign vulnerabilities to responsible personnel. You can also use any detected vulnerabilities and hardware assets in your risk assessments. All configuration settings for this have been moved to the default configuration file. You can find more information in the corresponding documentation. When using Active Directory or LDAP for user authentication, verinice.PRO now supports querying accounts in different subtrees of the directory. You can now create relations between the ISM-view and the IT-baseline view by drag and drop. You can now add controls and scenarios to user-defined modules in the IT-baseline-view simply by dragging them there from the IT-baseline catalogue. 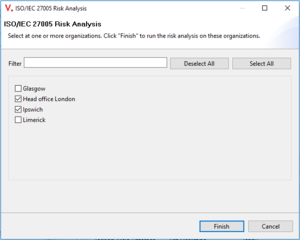 You can now copy and paste risk analysis objects in the IT Baseline Protection view. 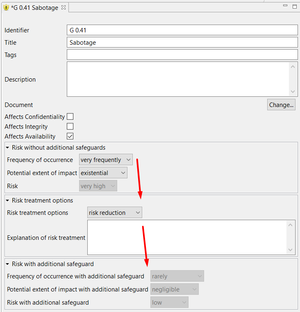 The import from the former GSTOOL (provided by the German BSI) database has been improved to correct IDs and criticality levels when importing IT Baseline Protection modules and network connections. Some changes were made regarding the fields for German privacy law. We will further develop this feature to include the European General Data Protection Regulation. We fixed over 100 bugs and introduced small improvements in this version based on feedback from our users. Amongst other changes, the account groups view now has an additional button to allow direct editing of accounts and sorting of special characters such as German umlauts has been improved both in the UI and in reports. The ISM Risk Analysis now calculates and saves all values even if the executing user does not have write permissions for some linked objects. We are proud to present version 1.12 of verinice and verinice.PRO which are now available for download. This version contains the following updates and improvements. A new perspective guides new users to experience the benefits that you get from combining the Greenbone GSM (OpenVAS) vulnerability scanner with verinice. Two new tutorials take you through the process step-by-step and show how you can import the results of a scan in verinice. In the IT baseline protection view the scan speeds up the necessary steps: the inventory can be updates with systems found during the scan. Fitting modules can be selected based on the identification of software from the scan. And finally the implementation status of technical controls can be set based on the scan results as well. This gives you a detailed view regarding implementation of information security controls on each individual system based on our extensive IT-baseline control catalogue which is included in verinice for free. We have increased the performance of our full text search engine in environments where verinice.PRO is being used with Active Directory- or LDAP-authentication. Our source code is and will always be open source. Now our development has become even more transparent. From now on our entire development work is also visible on Github. If you want to watch our team at work you can now do so in the verinice repository. For non-techies, the graphical reports may be more interesting. For example, the diagram showing branches in the source code during development. We have made further improvements for previous users of the now officially deprecated German "GSTOOL": you can now also import user-defined object types. 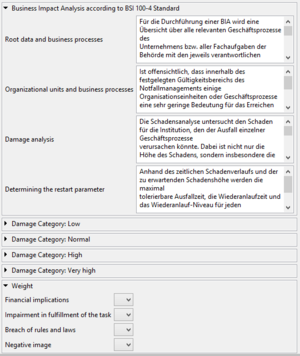 We have improved the wizard dialogue for users who are doing their risk analysis with the German standard BSI 100-3. If you are conducting your risk analysis in the ISM perspective based on international standards such as ISO/IEC 27005 you are not affected by this change. All risk analyses that are conducted in the IT-baseline perspective according to the German standard BSI 100-3 are now included in exports to VNA files. If you are conducting your risk analysis in the ISM perspective based on international standards such as ISO/IEC 27005 you are not affected by this change. Your objects were always fully included in the VNA exports. 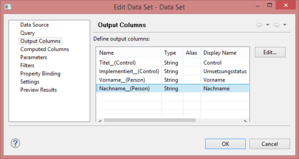 For users of the German IT-baseline perspective: all references to persons are now also included in the VNA export file. Previously on relations made using the relation view were exported. Now also the (older) form fields with references to persons are included. If you are working in the ISM perspective you are not affected by this change. All references here are made using real relations between objects and were always included in the VNA export. Fixed a bug that lead to the IT-baseline model not loading after startup. Fixed a bug introduced in V 1.11 that allowed relations to be created in the wrong direction (i.e. "document is author of person"). Updating to version 1.12 removes this possibility and will automatically repair relations that have been created incorrectly by changing the direction if needed. The verinice client now uses the Oracle Java Runtime Environment 8. IT-baseline catalogues are now loaded independent of the catalogue view being open. 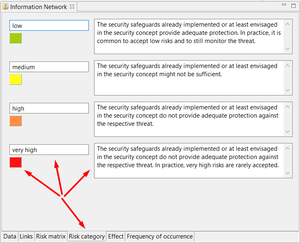 Read and write permissions on newly created IT-baseline risk analysis are now correctly taken from the parent object. LTR-report (a dataset that can be used in the vDesigner): threw an exception if only one top-level element was present, fixed. New splash screen and new icons. The validation view now sorts all elements correctly and updates itself on global refresh. The search index could be started multiple times simultaneously, fixed. The attachment file size was not saved when importing using the web service, fixed. The property field for file-size is now read-only. File view: the initial state of the button "link to editor" was wrong, fixed. The ISA-consolidator was transferring the target maturity of all controls, fixed. User profiles: deactivating the search function now also deactivates the toolbar button and the corresponding menu item. URLs to verinice web-pages on the welcome screen have been corrected. All IT-baseline elements now have an additional validation rule: title must not be empty. Editors of deleted elements are now always closed. The password dialogue now checks for invalid characters in passwords. Data for the account-groups dialogue is now loaded in a background job. Relations in the selection drop-down box are now sorted alphabetically. veriniceserver.gsmGenerator.cron=0 5 3 * * ? Datenbankmigration: Durch den Fehler [http://bob.sernet.private:8180/browse/VN-1280 VN-1280] können bestehende DBs korrupte Verknüpfungen enthalten. Dazu wurde eine Datenbankmigration geschrieben (neue Version: 1.03D), die beim Update auf die neue Version (des Clients) durchgeführt wird und zu verlängerten Startzeiten führen kann (je nach Größe der Datenbank (alle existierenden Verknüpfungen werden auf Korrektheit (Richtung) geprüft)). Starting with version 1.11 verinice and verinice.PRO received a search function, allowing users to find objects in mere seconds. The entire database is continuously indexed to ensure superb performance even with large databases. verinice deploys the open source framework Elasticsearch. This search engine - used among others by Wikimedia - has been fully integrated into verinice and verinice.PRO. The search will be displayed in a new view, which can be opened multiple times. So several searches can be carried out parallel and results can be compared. Note: To achieve the best indexing possible the language setting of the verinice.PRO server or of the verinice standalone clients should match the language of the information entered by the user. The columns included in the search view can be customized. Additionally, verinice now remembers the user-specific configuration of the displayed fields. The displayed search results can be exported as a CSV file. This allows to further evaluate lists of found objects in Excel or LibreOffice. The verinice.TEAM has carried out numerous and extensive improvements to the GSTOOL import. Many fields have been completed and the list of subtypes has been extended in order to take over from the last available versions of GSTOOL or supplementary deliveries all information networks can. GSTOOL is the official but now deprecated software tool published by the German BSI for its IT-Baseline standard. Some of the largest GSTOOL databases in Germany already have been transferred with verinice, each consisting of hundreds of individual scopes. Thanks to significant improvements in speed and memory usage verinice now accepts even those GSTOOL databases (with sizes of 1 gigabyte and more) in "one go". All targets are correctly allocated to the relevant scopes. Modules and module references are applied correctly. verinice even handles rare cases that cause other tools to stumble. Starting with version 1.11 verinice is able to completely convert the "Additional security analysis" as well as the risk analysis according to BSI 100-3 from the GSTOOL to verinice. All measures and risks are transferred. All intermediate steps are imported properly into the verinice wizard for risk analysis according to BSI 100-3. This way every single step of the imported risk analysis can be retraced later and edited again at any time: the threat summary, the risk assessment and the risk treatment. To maintain the individual intermediate steps is a mandatory requirement in order to create a standards-compliant A.6 report. verinice creates this report using the imported data at the push of a button. verinice now handles it correctly when during the import an asset is not associated with any scope, but is being referenced by other assets. In this case, all objects and relations between them are correctly mapped in order to ensure protection needs inheritance and all other mechanisms. All measures and blocks linked to persons (interviewers, interviewees, project managers...) are correctly accepted as references in verinice. A new template simplifies the creation of reports with linked elements in the vDesigner. verinice now contains the updated version 2.1.3 of the VDA ISA questionnaire. The Object Browser now responds to selections of links - this allows to navigate interrelated controls even better. verinice.PRO now uses the RedHat supported OpenJDK 7. The layout of the account groups view has been improved. All title fields now have an optional validation rule, which marks untitled objects. The dialog "New Link" now allows to directly select the desired link type. The button "Multiuser" is now named "Server" to coincide with general wording. When adding attachments verinice now remembers recently used folders. GSM Import: scenarios and vulnerabilities that have been imported from OpenVAS or Greenbone GSM will now be marked in color depending on the severity. Missing write permission on the report template folder will be noticed and displayed as an error message. The ISA consolidator now no longer overwrites the ISA version number. The Object Browser is now displayed in all perspectives by default. The icon of view "Review plan" has been changed. The package for Mac OS X now includes the most recent version of the Java Runtime Environment 7 by Oracle (Apple's Java 6 package still has to be installed, even though it's not used to execute verinice). Important note for the update: Due to the necessary data migration, the first launch of verinice clients after updating may take a bit longer than usual. Don’t panic. For more information, see the section "Display of file size in the File View". Please also note the general indications regarding the update and the release notes. The full text of the IT Baseline Protection Catalogs published by the German Federal Office for Information Security (BSI) is now available in English. Especially international teams benefit from this, simplifying the work with the IT Baseline Protection significantly. Users of the native ISO 27001: 2013 can profit from the comprehensive catalog of risks and controls, too: In a risk assessment or a risk treatment the Basic Protection Catalogs can be used as database on specific topics like Windows or SAP. All risks can be used as scenarios in an individual risk analysis as well. 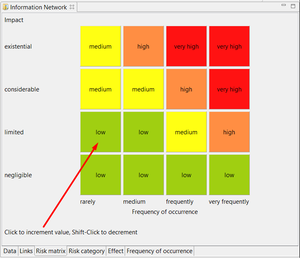 Simply drag-n-drop the desired risks or whole modules into the Risk Model. The catalogs, containing more than 1,000 Baseline Protection Controls, also proof to be useful in the case of a risk treatment. As specific controls, they supplement the generic requirements of ISO / IEC 27002:2013. The controls are easy to drag-n-drop to the ISM-Risk Model. The English IT Baseline Protection Catalogs correspond to the 13th update from the BSI. Thanks to our verinice.PARTNER Alexander von Ossowski for contributing the English archive of the IT Baseline Protection Catalogs and his ongoing support for the verinice project. verinice V 1.10 fully supports the new edition of the IS-Assessment catalog published by the German Association of the Automotive Industry in version 2.x. Apart from the actual catalog, the method of calculating the averages and the "Total Security Figure" have been adjusted. 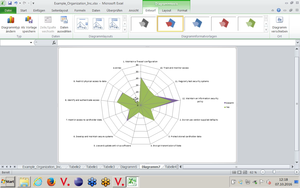 The issued report provides the radar chart indicating the level of maturity reached and the target level of maturity for each chapter, taking into account all the questions marked “NA". a consolidator allows to import assessment results originating from the VDA 1.x standard. Shifts of controls etc. are taken into account properly. Note: After updating to V 1.10 the file size information is updated in the database. The update will be triggered at the first connection of a verinice client to the database. Depending on the number of attachments this can take between a few seconds up to several minutes to complete. We therefore recommend to immediately perform a client-start after the server update, so the update is complete before the first regular user login. The operation is run only once. On Windows clients verinice.PRO now supports Single-Sign-On: registered users automatically can login to verinice.PRO. Re-entering the username and password are not required. The previous registration mechanism with renewed user and password input is still available optionally, e.g. if you want to work in verinice with another user as the logged in under Windows. Starting an AD-Import it is now possible to select whether the imported persons and accounts are created in the ISM or in the Baseline Protection model. The full text of Baseline Protection Controls can now be viewed via the web front-end for tasks. This makes it easier to delegate the basic security check as well as control of the implementation. The local report filing on the verinice client now works as intended. The standard account view changed to: "Last name, first name [account]". Account groups are not displayed in the total list of all accounts as before, but only those who are not included in the selected group. This facilitates the search for non-associated accounts. The customized file ("SNCA.xml") will no longer be moved during the update process but will continue to operate. Attention: Please continue to follow the update instructions for dealing with configuration files! Please see the notes Update von Konfigurationsdateien - we're working on an English translation as of now. Migration to DB version 1.01 regarding the filesize property (see "Display of file size in the File View"). The verinice.TEAM is expected to publish the next verinice version - V 1.11 - shortly, presumably in two month. An indexed full text search of all the elements in the database will be the most significant innovation of V 1.11. We would like to make this useful feature available as soon as possible for our users - so we opted for a timely publication. Before updating to verinice 1.9 please ensure that there is no account group matching a login name. Otherwise, it may lead to serious conflicts - making the installation unusable after the update and necessitating a roll back to the old version.